"What is required is a silent place with a face turned toward Mecca. The space must be vast so that the heart may feel at ease, and high so that prayers have room to breathe." The words from no less than Le Corbusier himself, writing in Le Voyage D'Orient (1911). He has it about right, too, though until the Muslim conquest in 1453 the greatest church in the East had nothing to do with Mecca. 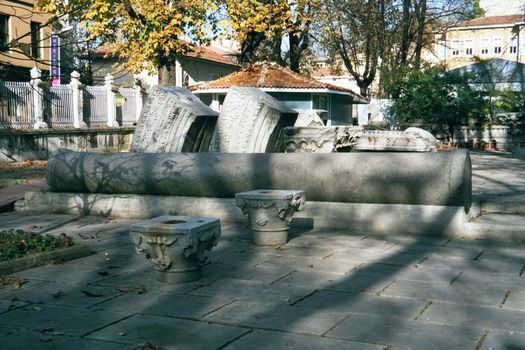 Sogukcesme Sokak, the Street of the Cold Fountain, between the walls of the Topkapi Palace and the Aya Sofya. 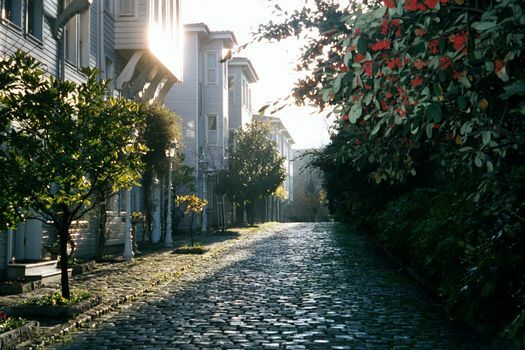 It's an amazingly peaceful street in an amazingly central location. 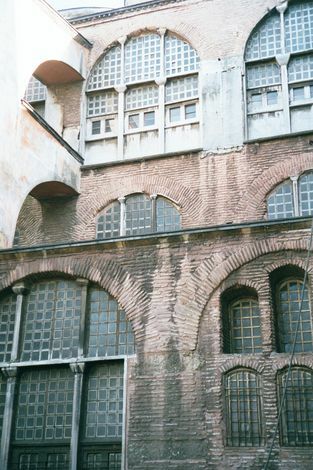 The row of nine houses on the left constitutes the Ayasofya Pansiyonlari, converted to a hotel in 1985 by the Turkish Touring and Automobile Association. We're here for what lies over the wall on the right. It's a mountainous 6th century church, which after 1453 became a mosque and since 1935 has been a museum. 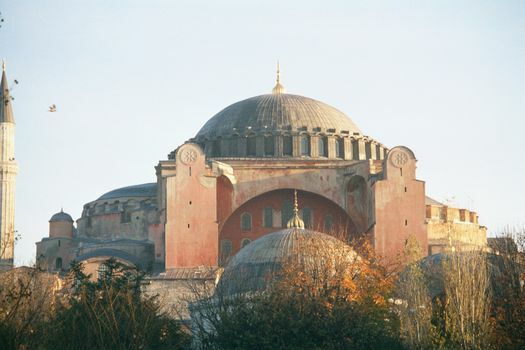 It's been known variously as Aya Sofya (Turkish), Hagia Sophia (Greek), or Santa Sophia (Latin). This view is from the south, so the street shown in the previous picture is actually behind the church as it appears here. The dome, which in Roman practice was perched on a cylinder, is here more or less for the the first time perched on a hollow cube whose upper corners are filled by spherical segments called pendentives. 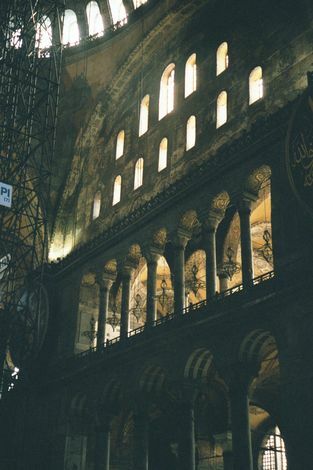 It's a pioneering accomplishment of the Emperor Justinian's Greek architects, and it allows the weight of the dome to rest on four piers under the pendentives and thus create an interior volume whose sides can be reduced to colonnades, lit from windows beyond the bordering aisles. The lateral thrusting that pushes the piers outwards is offset on the north and south sides by massive buttresses (the southern pair appear prominently in the picture). Thrusting east and west is offset by hemispherical half-domes (the darkly lead-plated west one is visible in this picture); their weight rests partly on the four main piers and partly on a pair of piers at both the eastern and western ends of the building. The three domes and half-domes, along with a wrapping of comparatively low aisles, form a square with sides about 200 feet long, under a dome 180 feet high. Originally, there was an entrance hall or atrium on the west, but it's gone. The minarets were added after the Muslim conquest, by which time the church, built between 532 and 537, was already 900 years old. A closer view. The buttress piers are massive; in fact they hold staircases with about ten stacked flights. Notice the windows, too. Although many have been blocked, they are critical to the architects' intentions of creating a space filled with light. A closer view of the profusion of windows--and a good illustration of the fact that Aya Sofya was built of brick, not stone. Another view of those windows, which are easy to overlook at first glance, when you behold the immense mass of the building. This picture is from the west side, which is the entrance. The column is a reminder of the atrium that once formed a rectangular entrance hall. Bits and pieces of that atrium. 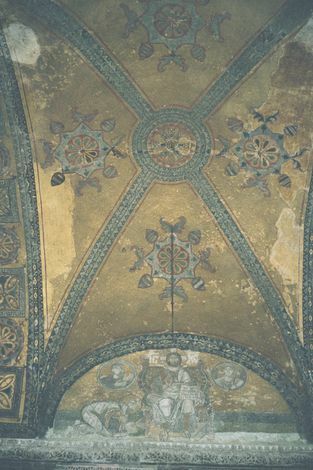 Inside: the narthex or narrow entrance hall is plain, except for these vaults with mosaics. 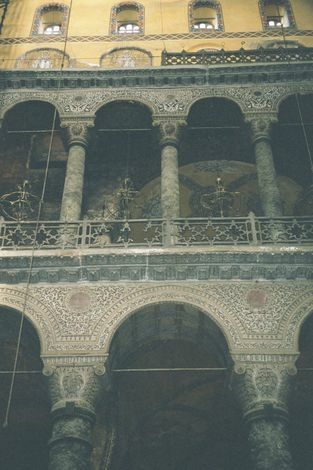 The interior of the church was once profusely decorated with radiantly golden surfaces. The south tympanum, which is under the dome and forms the south border of the nave. Although many windows have been blocked and many gold-ground mosaics covered, there's still a lot of light. Imagine what it was like originally. 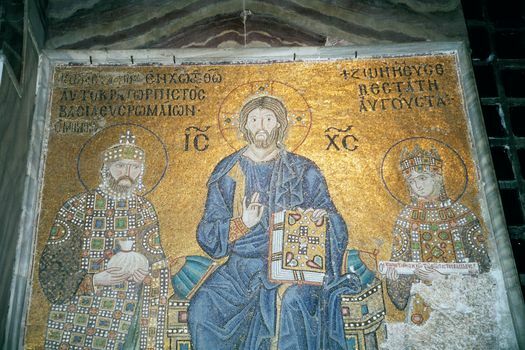 If you can't, read Procopius, who saw the place when it was new: "You might say that the space is not illuminated by the sun from the outside but that the radiance is generated within, so great an abundance of light bathes this shrine all round." Tiers of colonnades forming the tympanum. 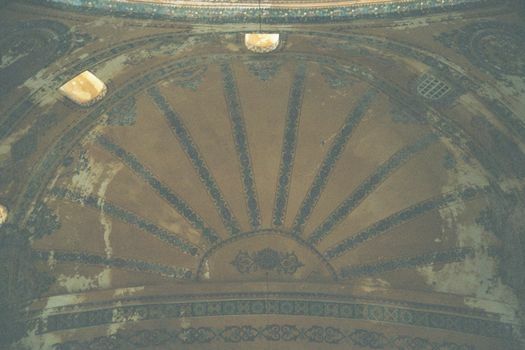 The shell of one of the adjoining half-domes. Want to go upstairs, to the galleries that are above the aisles? They were once reserved for women, who were not allowed on the main floor. 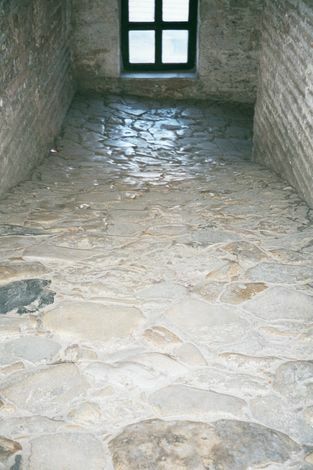 The way up is by seven consecutive ramps of well-worn stones. The flooring of the north gallery: marble, with significant sagging. Think the galleries a little dull? They weren't always so. The south gallery has a pair of mosaics, covered after 1453 but now restored. 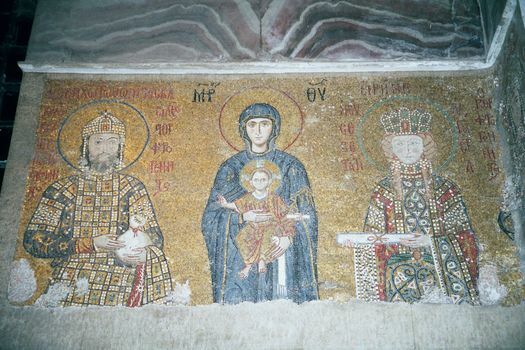 The first shows the Emperor John II Komnenos giving money to the Virgin and Christ child; Empress Irene holds a scroll. One window away, another emperor and queen do the same. 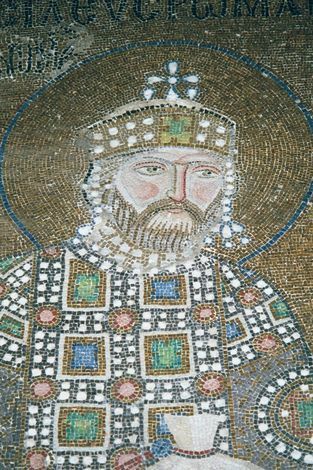 Detail of the previous mosaic: Constantine IX Monomachus. 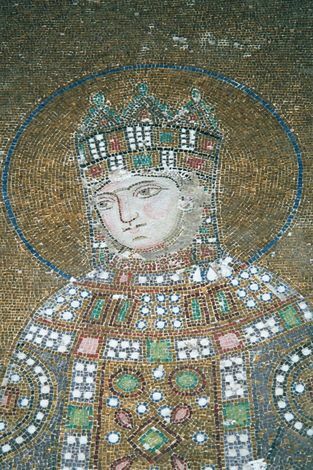 He was the third husband of the Empress Zoe, whose career comports more with the adjective "byzantine" than with this saintly image. 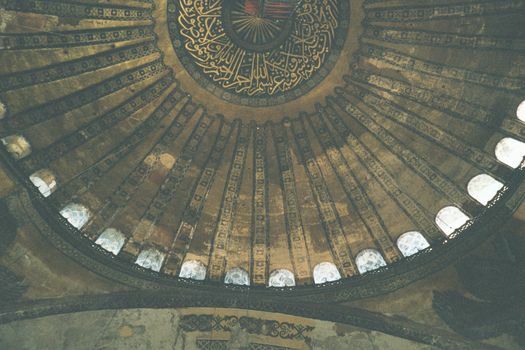 Aya Sofya established a style that lasted through the height of the Ottoman Empire. 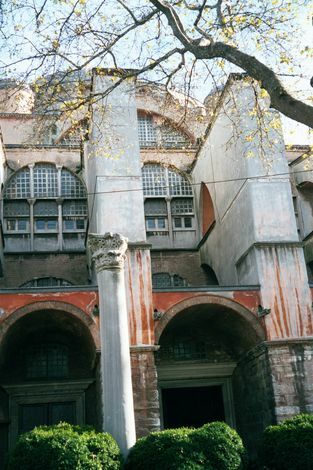 Here's a competitor, very easy to compare with Aya Sofya because it's next door: in fact this picture was taken from the same spot where the first picture of Aya Sofya was taken; the camera's merely done an about-face. Who is this competitor? 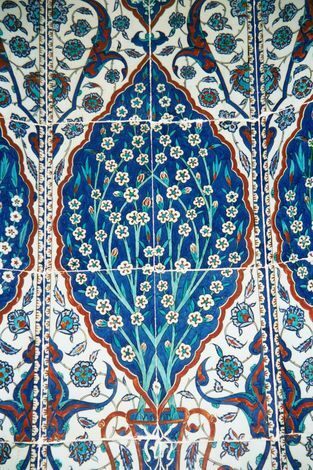 It's the badly misnamed Blue Mosque, more properly the mosque of Sultan Ahmet. At first blush it's a copy, executed more than a thousand years after the original. (The mosque was built between 1606 and 1616, the year of Shakespeare's death.) The curvature of the dome is different, though, and from the inside the columns supporting it are elephantine. In fact they probably over-emphasize the job they're doing. Another "imitation," although the belittling connotations of that word are unfair. 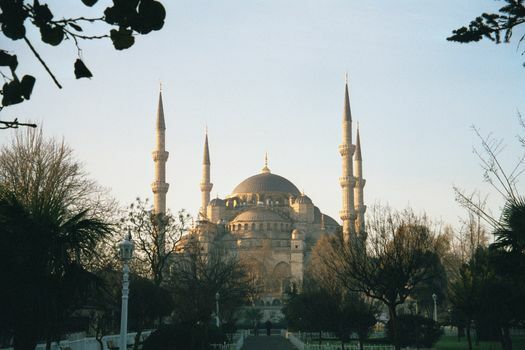 This is the Suleymaniye Mosque, built by Sinan, the chief architect of Suleyman the Great. 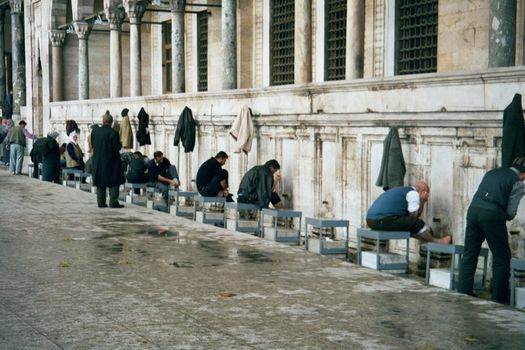 It's mid-16th century, a few decades earlier than the Sultan Ahmet mosque in the last picture. Both are working mosques. 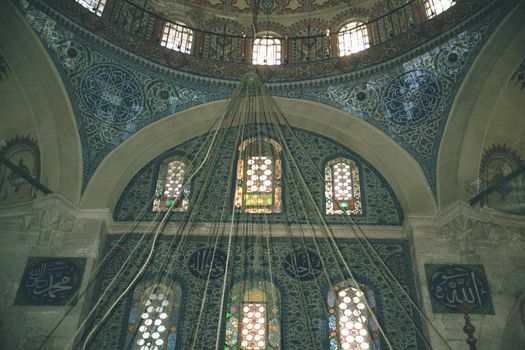 Want to go inside the Suleymaniye? 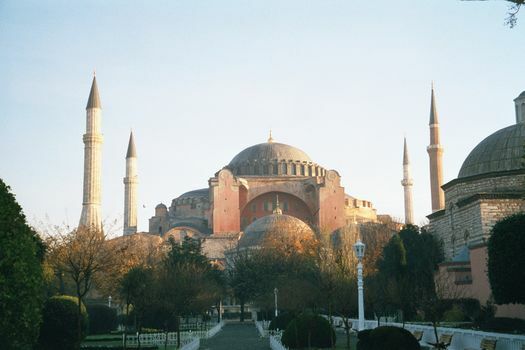 It was built between 1550 and 1557, a thousand years after Aya Sofya. 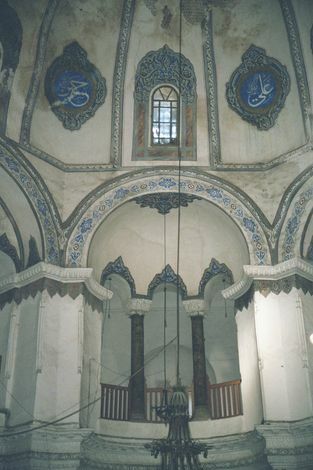 The dome here is supported by pendentives on columns forming an octagon. 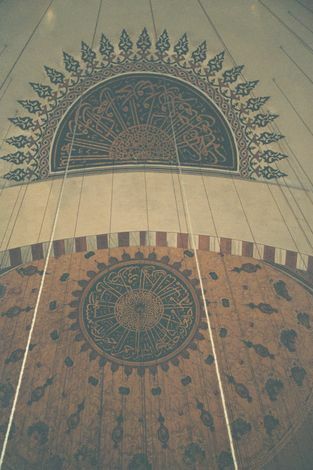 The medallions encircle the dome and mention by name Allah (on the right), Mohammed (on the left), and the caliphs. A detail of the main dome and an adjoining half-dome. 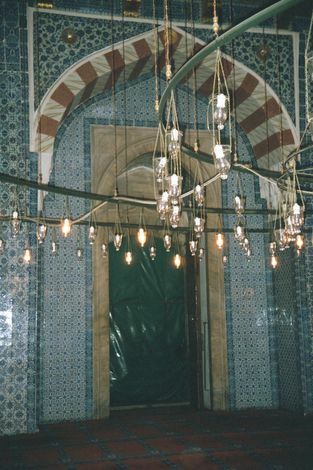 The city is awash in mosques of a similar style. Here the so-called little Aya Sofya. And here, one of those magic moments. It's the Sokullu Mehmet Pasha mosque, built in 1571 by Sinan, the same architect who built the much grander Suleimaniyeh mosque. 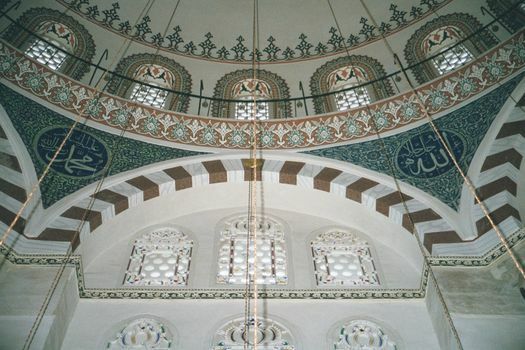 It's one of four mosques built by Sinan for Sokullu Mehmet Pasha, who for 15 years was the grand vizier of Suleyman and his successors. This one honors Sokullu's wife Esmahan Sultan, daughter of Sultan Selim II. 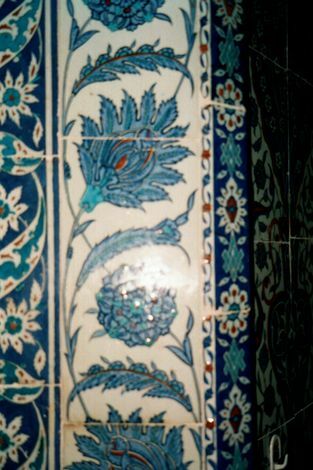 The blue tile came from Iznik, a town specializing in its production. 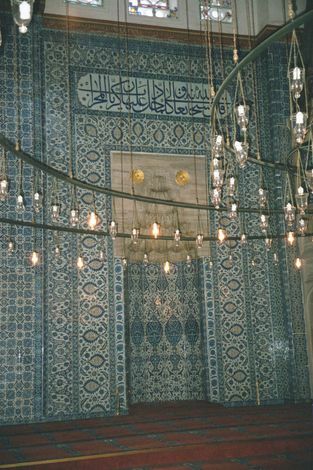 The tile blankets the east wall of the mosque. A few minutes after this picture was taken, it was time for Friday prayers. The room filled. An imam started leading the group in prayers that--as Corbusier wanted--had room to breathe. 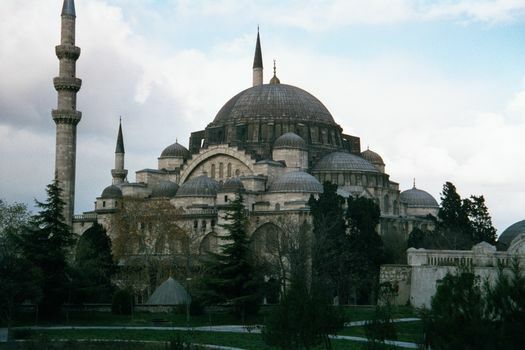 Here's where the Ottoman architects broke free from Byzantine tradition.